This Home screen is displayed after you log in to Sketch Engine or after you click Home in the left menu before you select any corpus. The screen gives you options to manage corpora (but not search in them) as well as options related to your Sketch Engine account or site licence. The Home screen is always in English and the interface language cannot be changed. 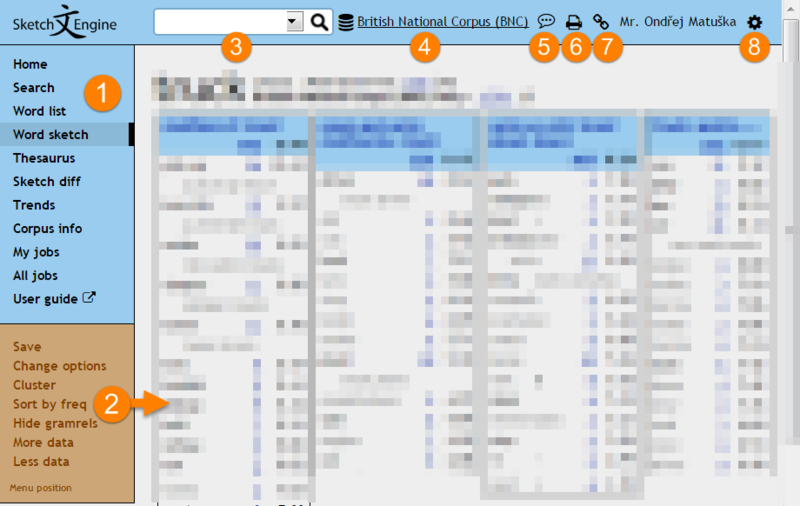 This screen is displayed after the user selects a corpus and allows to search the corpus data. Note that the available options depend on the corpus and the feature selected. Refer to the respective feature for details. 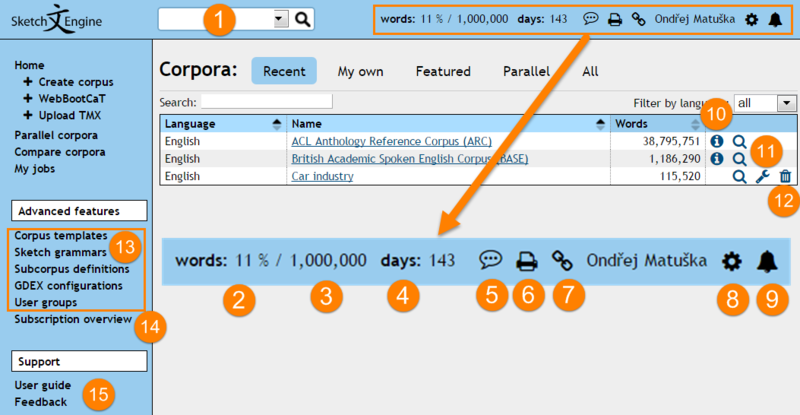 The interface language of the corpus search screen can be changed, see below. See more about Sketch Engine Localisation or translators. You can save your permanent link and use it to come back to your results later or share with colleagues. Alternatively, you can simply copy the URL from your internet browser to share it. However, the URL contains all your search criteria and may be very long, making in impractical. What is more, some email clients do not support links stretching across several lines so emailing the link might be impossible. To select more than one options (e.g. on the concordance view options screen), hold down the CTRL key while clicking on the options. The Menu position link at the very bottom of the menu allows for changing the position of the menu from vertical on the left to horizontal at the top. If you change the interface language to a language you do not understand by mistake, click on this link to reset language to English.